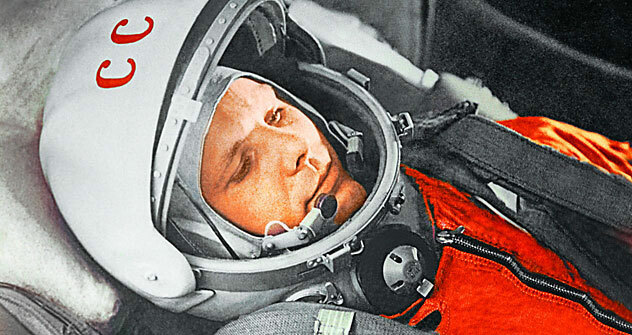 Yuri Gagarin's first space flight on April 12, 1961 is now the stuff of legends. But as the world remembers 'First Cosmonaut', Russia sets new frontiers for the future. Fifty years ago on April 12, with a stirring cry of “Let’s Go!” (Poekhali), cosmonaut Yuri Gagarin raced on a Soviet rocket to become the first human to go into outer space. Launching in the Vostok spacecraft from Kazakhstan at 9.06 a.m. that radiant sunny day in 1961, the 27-year-old son of a carpenter circled the Earth once on a 108-minute space flight before parachuting safely to the ground in the Saratovregion of the U.S.S.R.
"The Motherland hears, the Motherland knows where her son flies in the sky,” he whistled a popular Soviet patriotic song over the radio while orbiting the planet at 17,000 miles an hour. Within a few hours, word of his feat had spread across the globe and a new era had begun. Driven by the Soviet Union’s quest to assert technical superiority over the US, Gagarin’s flight became one of the 20th century’s milestone achievements. This short but epic foray into outer space inspired millions of people around the globe, and ignited a Cold War race between the superpowers for technological superiority. “Not one psychologist, not one politician could predict the effect Gagarin’s flight would have on the world,” Alexei Leonov, another member of the original 20-man squad of Soviet cosmonauts, told Russia Now. “This was the finest competition the human race ever staged; who could build the best spacecraft, the best piloted rocket…"
For more than two decades, the two rival powers pitched their finest engineering minds against each other. The American Moon landing in July 1969 eclipsed everything else, but it was the Soviet Union that mostly led the space race in the preceding years and often afterwards. Space exploration has, however, become increasingly cooperative since the end of the Cold War, especially with the ongoing assembly of the 18-country International Space Station (ISS). Amid the unfolding competition, one thing has not changed: on April 12, Russians everywhere honour the space odyssey legacy embodied by Gagarin. The young pilot tragically died in an aircraft crash in 1968 while in training for a second space mission, and his remains are interred near Lenin’s tomb on the Red Square. But even in the celebrity-studded age, he remains an icon. In a recent survey, 35% of Russians named Gagarin as their prime role model - “not only an ordinary person of this world but also the finest of our nation, our first envoy into space, a star of a man,” as Leonov described him. “Space will always remain a priority of ours. This is not just somebody’s interpretation; it’s our official state position,” Russian President Dmitry Medvedev told the ISS crew on Cosmonautics Day on April 12 last year. True, Russia’s $3 billion annual space budget cannot compete with NASA’s almost $19 billion, but more funding has been allocated to space in recent years as oil and gas revenues surged. Russia is a world leader in the commercial satellite launch market, which helps to propel its space industry. And while the U.S. agency had its manned Moon and Mars mission, Russia keeps those long-term plans on the drawing board, hoping to establish a Moon base by 2030 and stage a Mars mission shortly afterwards, according to Roskosmos space agency chief Anatoly Perminov. “And then the life’s dream of Sergei Korolyov will be fulfilled,” Perminov said in a recent interview, referring to the former inmate of Stalin’s labour camps who became the Soviet space programme’s chief designer and driving force until his death in 1966. Meanwhile, both countries are keeping an eye on China and India, as they pursue their own space ambitions. The Chinese made a third launch of their Shenzhou VII spacecraft and also their first spacewalk in 2008, while India is planning a manned flight by 2014. More than 500 men and women from 38 countries have flown into space, but with the ISS alone expected to cost more than $100 billion over 15 years, space exploration remains a hugely expensive and dangerous activity, with the loss of life estimated at 300 to 400 people over 50 years.